Mom and I like a good routine. However, on Saturday evening, we decided to throw caution to the wind and go to a Stop & Shop Supermarket out of town. I know what you're thinking - those broads like to live on the edge. We drove all the way to the Dartmouth store because of their large section of natural food items. Since we were in the mood for some healthier snacks, Mom and I perused the aisles until something caught my eye - animal faces on large bars of chocolate. Now I've seen these before, but I don't remember ever trying one. However, with 10 percent of the net profits being used to help save endangered animals, how could I resist? 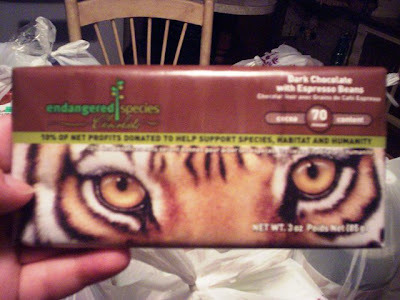 I grabbed a bar with a tiger face on it ($2.50) - which happened to be dark chocolate with espresso beans - and put it in our shopping cart. THE VERDICT: Sweet! Actually, considering that the cocoa content is 70 percent, I'm surprised that the chocolate wasn't bitter. Made with shade-grown coffee and chocolate, the minced espresso beans added a nice taste and crunchy texture to each piece. Inside the wrapper, there was a little blurb about the tiger and how there are several species of the animal already extinct. How sad! Also inside the wrapper was a $.25 cent off coupon for another bar. I really enjoyed this candy and would like to try the other flavors, and I'm very glad to know that - by eating chocolate - I did my part to protect the animals.